Grand Bahama Island, Bahamas - Here is what's new as of October 2014 related to books new to the adult Library. You can check previous lists for DVD's, Reference and other types of books. Grand Bahama Island, Bahamas - Here is what's new as of December 2013 related to books and DVDs new to the adult Library. You can check previous lists for DVD's, Reference and other types of books. Situated in the downtown area, on Mall Drive, the lending library is most definitely a pillar of the community. The Sir Charles Library stands next to the Rand hospital directly across from the Port Authority building. Grand Bahama Island, Bahamas - Here is what's new as of October 2013 related to books and DVDs new to the adult Library. You can check previous lists for DVD's, Reference and other types of books. 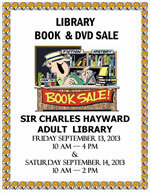 Grand Bahama Island - Here is what's new as of September 2013 related to books and DVDs new to the adult Library. You can check previous lists for DVD's, Reference and other types of books. Grand Bahama Island, Bahamas - Expect to hear a lot more from the Sir Charles Hayward Library as it seeks to become a center for learning on Grand Bahama. Grand Bahama Island - Here is what's new as of March 2012 related to Fiction, Mystery, and Non-Fiction books new to the Library. You can check previous lists for DVD's, Reference and other types of books. Grand Bahama Island - Here is what's new as of February 2012 related to Fiction, Mystery, and Non-Fiction books new to the Library. You can check previous lists for DVD's, Reference and other types of books. Grand Bahama Island - Here is what's new as of March 2011 related to Fiction, Mystery, and Non-Fiction books new to the Library. You can check previous lists for DVD's, Reference and other types of books. Grand Bahama Island - Here is what's new as of December 2010 related to Fiction, Mystery, and Non-Fiction books new to the Library. You can check previous lists for DVD's, Reference and other types of books. Grand Bahama Island - Here is what's new as of August 2010 related to Fiction, Mystery, and Non-Fiction books new to the Library. You can check previous lists for DVD's, Reference and other types of books. Grand Bahama Island - Here is what's new as of May 2010 related to Fiction, Mystery, and Non-Fiction books new to the Library. You can check previous lists for DVD's, Reference and other types of books. Grand Bahama Island - Here is what's new as of April 2010 related to Fiction, Mystery, and Non-Fiction books new to the Library. You can check previous lists for DVD's, Reference and other types of books. Grand Bahama Island - Here is what's new as of March 2010 related to Fiction, Mystery, and Non-Fiction books new to the Library. You can check previous lists for DVD's, Reference and other types of books. Grand Bahama Island - Here is what's new as of February 2010 related to Fiction, Mystery, and Non-Fiction books new to the Library. You can check previous lists for DVD's, Reference and other types of books. Grand Bahama Island - Here is what's new as of December 2009 related to Fiction, Mystery, and Non-Fiction books new to the Library. You can check previous lists for DVD's, Reference and other types of books. Grand Bahama Island - Here is what's new as of November 2009 related to Fiction, Mystery, and Non-Fiction books new to the Library. You can check previous lists for DVD's, Reference and other types of books. Grand Bahama Island - Here is what's new as of October 2009 related to Fiction, Mystery, and Non-Fiction books new to the Library. You can check previous lists for DVD's, Reference and other types of books. Grand Bahama Island - Here is what's new as of September 2009 related to Fiction, Mystery, and Non-Fiction books new to the Library. You can check previous lists for DVD's, Reference and other types of books.